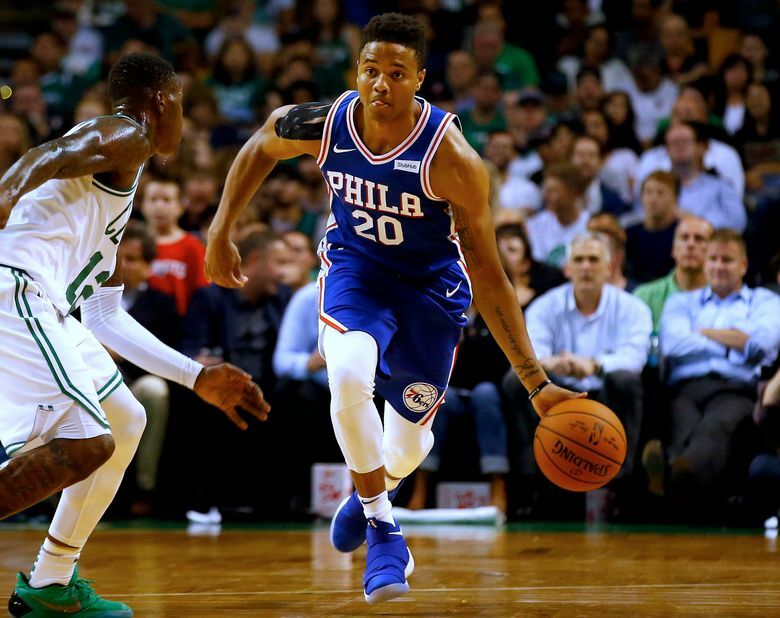 PHILADELPHIA – The Philadelphia 76ers feel good about rookie guard Markelle Fultz’s progress from his shoulder injury. Fixing a sagging jump shot appears to be a bigger obstacle. Fultz, a former Washington Huskies standout who was the first player taken in last year’s NBA draft, has appeared in four pro games, the most recent on Oct. 23. Since then, he has been rehabilitating from left-shoulder soreness and muscle imbalance and working on his shot. Fultz recently joined teammates in five-on-five scrimmages during practice. The media have not seen these sessions. But on Sunday after practice, Fultz was seen on a side court, competing against teammate Timothe Luwawu-Cabarrot, with Sixers coach Brett Brown guiding both players. No timetable for Fultz’s return has been released. When asked whether Fultz must be 100 percent physically to return to the court, Brown gave a telling response. Brown said he has been pleased with Fultz’s progress at the free-throw line, but the rest of his outside shooting apparently is a major work in progress. Since his last game, Fultz often has been unavailable to the media. Brown said he doesn’t think Fultz is 100 percent physically, but it’s the apparent lack of confidence in his shot that seems to be keeping him out. Fultz, 19, shot 41.3 percent from three-point range in his only season at Washington, where he averaged 23.2 points, causing many observers to wonder why he felt the need to tinker with his shot last summer. In four pro games, Fultz has shot 9 of 27 (33.3 percent) from the field, 6 of 12 from the free-throw line and hasn’t attempted a three-point shot. Brown said at this point, there is no set distance Fultz must show he can shoot from in order to return to action. “You can tell there is work to be done and I think it will be as much of an eye test and gut feel as it is a distance,” Brown said.